"Thanks to the Sacred Jewal Shard in my forehead!" "Thanks to the Sacred Jewal Shard in my forehead!" The above info came from MAJORA64, and was edited by yours truly (contact me). The image came from Inu-Yasha Moon. Kyoukotsu is a canibalistic human, however "human" might not be the right word for this creature because of his size. 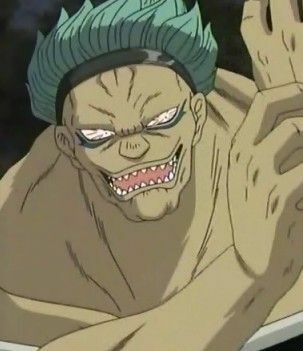 He is the weakest of the Shichinin-tai (a group of 7 mercenaries) despite his size. He is founded by Koga while he's searching for Naraku, he first sees him eating demons, and he claims eating demons is what made him so huge. He fought Koga using his enormus arms and fists, then Naraku's sainyosho fused into a ball 'n' chain to kill Koga. He could of killed Koga but he made the biggest mistake of his life: he bragged that the sacred jewel shard in his forehead kept him alive. Koga twisted Kyoukotsu's head around 180-degrees, but not even that stopped the giant. 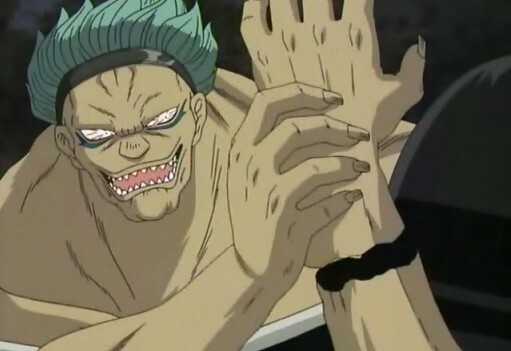 He grabs Koga and in attemps to eat him, but then Koga's hand goes through his skin and pulled out the shard and Kyoukotsu instantly turned to dust. "Kyou" in japanese means "dark" or "evil" because he looks like a demon and "kotsu" means "bone" because he was once dead. An interesting fact about him deals with the Sacred Jewel Shard. His members all have shards in their necks but Kyoukotsu is the only one that has a shard elsewhere. My theory: his skin was too thick and his neck was too big to be cut so they used a spear to the head to kill him. Kyoukotsu appears in episode #102. The above description came from MAJORA64, and was edited by yours truly (contact me).